PHILADELPHIA, April 25, 2013 /PRNewswire/ — Elsevier’s Office of Continuing Medical Education (EOCME) announced today that it is extending its existing collaboration with AcademicCME and ArcheMedX to re-launch the ThrombosisClinic.com website. The ArcheMedX connected learning platform will power the new site to create a collaborative learning experience for interdisciplinary teams of clinicians. “The all-new, ThrombosisClinic.com will be a critical resource designed to reduce mortality and improve outcomes for patients with thromboembolic disease by providing clinicians with a more effective and more efficient lifelong learning solution,” said Sandy Breslow, Director of the EOCME. The new site provides a one-of-a-kind educational resource for the entire interdisciplinary clinical team, including physicians, nurse practitioners, physician assistants, nurses, pharmacists and other healthcare providers dedicated to thrombosis prevention, treatment and management. By delivering advanced education to the complete clinical team including underserved clinical areas such as dentistry, orthopedics, and OB/GYN, “ThrombosisClinic.com will provide clinicians from primary care to intensive care access to evidence-based strategies that can be immediately employed in practice,” said Dr. Timothy Hayes, President of AcademicCME. The site will centrali ze the clinician’s natural learning actions and simplify their lifelong learning journey. In an age when clinicians face a daily challenge to stay current with new and emerging best practices, the all-new ThrombosisClinic.com will introduce resources and an innovative set of connected learning tools that clinicians need to streamline their information gathering and support practical, lifelong learning. Recent data suggest that the majority of clinicians are using new social technologies for the express purpose of lifelong learning and professional development. 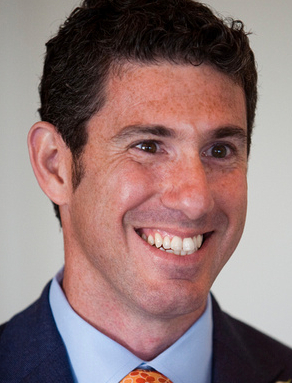 As a result, Brian S. McGowan, PhD, Co-Founder & Chief Learning Officer of ArcheMedX, said, “A key innovation of the all-new ThrombosisClinic.com site is the launch of a series of curriculum-based “Virtual Courses” designed to more effectively educate interdisciplinary teams as they participate in collaborative learning activities.” Small, trusted cohorts of learners will engage with faculty and assist each other in completing educational objectives throughout the virtual courses and collaborative learning environment. Powered by the ArcheMedX Connected Learning Platform, the site will seamlessly connect the virtual courses and new forms of educational content to Elsevier’s comprehensive archives of clinical publications, making it simple for clinicians to access, review, share, and apply related educational content to clinical practice. 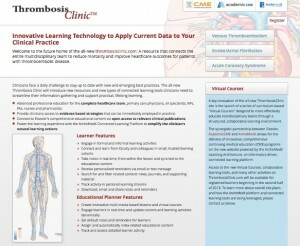 Access to the new Virtual Courses, collaborative learning tools, and other educational activities on ThrombosisClinic.com will be available for registered learners beginning in the second half of 2013. To learn more about overall site plans and how the ArcheMedX platform and connected learning tools are being leveraged, please contact Sandy Breslow Director, Elsevier’s Office of CME, or Timothy Hayes, MD, PhD, President of AcademicCME. For additional information on the ArcheMedX Connected Learning Architecture and the Natural Learning Actions Model, please contact Joel Selzer, Co-Founder & CEO of ArcheMedX, Inc.
AcademicCME is an accredited healthcare solutions medical education company designed to impact practice behavior and thus patient outcomes. AcademicCME leadership draws on extensive experience with clinical research, clinical practice and the delivery of continuing medical education. The team at AcademicCME has a unique understanding of the dynamics between physician behavior, patient care and practice-based educational needs. Therefore, educational content that presents up-to-date evidence based data is transformed into practical applications in daily clinical practice. Visithttp://www.academiccme.com for more information. ArcheMedX is a healthcare informatics and e‐learning technology company with the singular mission to build the structure required to transform medical education through new connected learning and assessment models. By engineering an informatics‐powered architecture that organizes and connects the natural learning actions of clinicians in one system, ArcheMedX simplifies lifelong learning and streamlines the process of educational planning, assessment and support. Visithttps://www.archemedx.com for more information.